P managed to fit in one last adventure with Chip Morrill in the Mokelumne Wilderness last weekend, this time hiking down the Mokelumne River from Hermit Valley to Deer Creek and beyond. This is a really beautiful area with deep pools in the river, wonderful views, and great campsites. But this is also very isolated country. 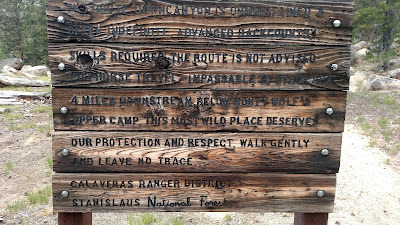 In fact, the sign at the trailhead pretty much discourages anyone from hiking down more than a few miles. On the other hand, the scenery in amazing, and we had a great time trying to make it more accessible to more people. We hiked in on Friday morning, a crew of four volunteer and Chip. We did a bit of lopping and trail work on the way in, and set up camp at the confluence of Deer Creek with the Mokelumne. The trail to this point was not bad...and M and P had hiked it years ago, and we managed to follow it to the cascade at the bottom of Deer Creek. spent at least an hour and half just looking for the best possible place to cross: the perfect solution would include a nearby dead tree to drop across the creek to form a bridge. After a lot of bushwhacking and consulting, Chip made the call, and we got to work with the saw. Before you knew it, we had a bridge that would withstand high water and was pretty darn stable. We use it for the rest of the weekend as we worked lower down on the river. The next day we hiked the trail, lopping bushes where they impeded progress, cutting through logs where they blocked the trail, marking the trail with logs and branches where we could find them, digging out duff through the forest floor, and putting up cairns where the trail went over solid rock. Hard work, but we got a lot done. Day three began with Chip suggesting that we might want to take a quick one-hour hike up Deer Creek to see the cascades. I think we were all perfectly happy to get to work, but also really appreciated Chip's desire to make sure that we really enjoyed the trip. We happily followed him on a bushwhack up the creek...which turned out to be a two and a half hour adventure up granite, through manzanita, under trees, and over logs. What fun! And the views we attained were really amazing. Once back in camp, we loaded up our tools and headed down the Mokelumne. Another tree sawn through, more work with McCleod and loppers, and we stopped for lunch on the gravel beach of a lovely deep pool. From there the trail became a bit confused, and we finally determine the best route through the last bit of forest...and then it opened up into the granite of the canyon itself. We followed cairns and did some minor work for another stretch of the trail, until it dipped down around a small granite dome. We were done for the day, so hiked up to the top of the dome and took in the view--well worth three days of trail work! The next day we packed up our camp, packed up the tools, and hiked back up to the trailhead, stopping to fix one section of the trail that had really been mixed up, and lopping whenever we got the chance. By 11 we were back at the cars, and driving off on our separate routes back to civilization. We had seen only a handful of other people over four days. How much fun was this trip? Jan and Vicky, excited about the work, decided they would come back in the near future to finish off the lopping and trail clearance nearer the trailhead. A great way to spend a few extra days in the wilderness, with good people and glorious weather.